Please join the UC Gill Tract Farm on Sunday, April 23rd for a day full of food, fun, farming, music, and workshops! Come celebrate Earth Day with us! The day will consist of digging in the dirt; a delicious farm-grown lunch; kids' activities; educational workshops on traditional foodways, agroecology, and mugwort; live music from local artists; new friends, and much more. While donations are always accepted and help support the survival of the farm, the event is free. We can't wait to see you there! This is a FREE event. Donations at the door will be appreciated. Registration recommended: FREE Donations are appreciated. Ticket info: Tickets go on sale April 23. 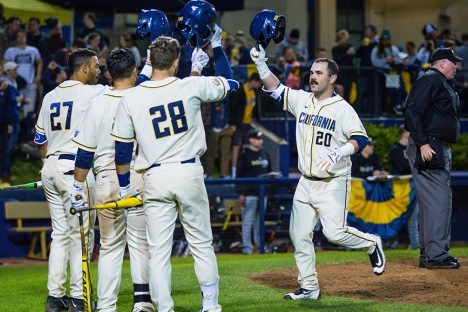 Cal Baseball hosts USC in conference action at Evans Diamond. Straub-Huillets aesthetic of spoken word plus projected image, history plus landscape, was boiled to its essence in this cine-essay featuring legendary Italian New Left figure Franco Fortini. With Lothringen!, based on novels byMaurice Barrès. Gena Rowlands, John Marley, and Seymour Cassel star in this unflinching night-long journey through a marriage on the rocks, a film against all people that know and for people that just feel (Cassavetes). U.K. band Bastille made its debut in 2013 with the album Bad Blood, which entered the U.K. album chart at No. 1. It has since sold more than four million albums worldwide alongside 11 million singles.